Bella FSM is pleased to announce it was listed in “The Top 20 Most Affordable Field Service Management Software” 2016 report by Capterra. The analysis compiled a pricing scenario based on a “typical field service software buyer” that has 2 office managers and 4 technicians (6 users) who typically complete 400 jobs total each month. With 100’s of field service solutions on the market today, this research will assist business owners when deciding which solution to use. 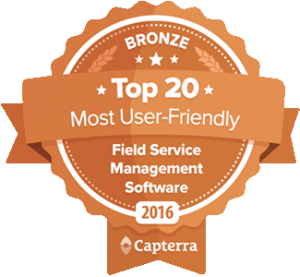 Most field service companies spend about $1,500 per year on field service management software. Depending on the size of your business, this might seem like a large chunk of your revenue to set aside just for a fancy computer program. After all, you can still manage your workers in Excel or on a whiteboard, right? It’s true, you can, but you should reconsider whether you should. It turns out that money put towards field service software could be money very well spent. In certain cases, companies who have implemented software to automate day-to-day processes have seen an 80% increase in the number of jobs completed overall. Field service management software can cut costs in many areas of your business. Not only does it help track your open invoices, it can also help you create more strategic routing maps for your staff, helping to save on fuel costs and travel time between jobs. Plus, FSM software can help you keep an eye on your inventory to make sure your parts are always well-stocked and you only re-order items when it’s necessary. Fortunately for you, Capterra surveyed field service products and came up with our Top 20 Most Affordable Field Service Software report to guide you through some budget-friendly options. Over all the systems they evaluated found that the average cost per user per month for a field service solution was about $40. Each feature in a system cost, on average, about $20. So if your company is bigger than the one in our pricing scenario, or if you’re looking for a more robust system than our feature set allows, you can use these numbers as a starting point to estimate your total cost. ABC Company is a first time FSM buyer that has 2 office managers and 4 technicians (6 users) who typically complete 400 jobs total each month. They would like to use the system for at least two years, need as many of the features listed below as possible, and need as many of the following training and support resources as possible (open API, videos, email/help desk, FAQ/knowedge base, demos, articles/training documents).